We welcome all members. Some of our members are totally new to sailing. Some of our members have been sailing for decades. Some have sailed around the world (one did it twice). 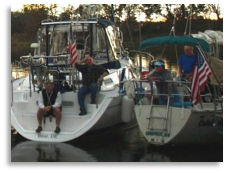 Skippers are members who have sailboats and share their love of sailing with the rest of us. If you don’t know how to sail, this is the place to learn. If you do, then jump on board as a crew member or 1st mate. We have room for all, including you!